China’s economic dominance is showing more cracks, and in April, the indicator of manufacturing activity, the purchasing managers’ index (PMI), fell to a one-year low. The HSBC Flash China Manufacturing PMI for April fell to 49.2 from 49.6 in March, still below the 50 mark which separates expansion from contraction. The last time the PMI was above 50 was in February 2015. "Operating conditions in China's manufacturing sector deteriorated slightly for the second month running in April," HSBC economist Qu Hongbin said in a statement. The world’s second largest economy grew by seven percent, its slowest pace in six years, during the first three months of 2015. The Chinese authorities expect the same growth for the entire year, which still makes it the fastest growing developing economy in the world. The $11.3 trillion economy is being aided by stimulus measures from the People’s Bank of China, which has cut bank reserve requirements by 1 percentage point and has twice cut interest rates since November. Analysts expect weaker growth in sectors like manufacturing could push the bank to pursue an even looser monetary policy, especially more interest rate cuts, which could devalue the yuan significantly and naturally de-peg it from the dollar. The Flash PMI report is based on about 90 percent of responses to surveys sent to more than 420 manufacturers. 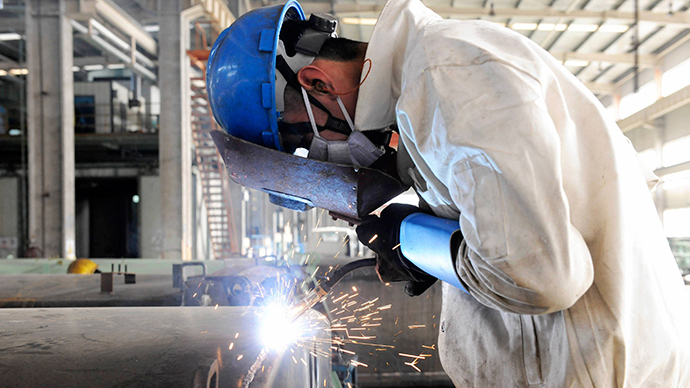 It is an overall measure of the health of China’s manufacturing sector.